Carrie Haddad Gallery is pleased to present INSIDE OUTSIDE, an exhibit that merges unique perspectives of the natural and man made landscapes. The tradition of artists documenting their environment is one that transcends time and trend. Whether it be a reproduction of an iconic Hudson River view, the Brooklyn bridge, or the living room at grandma’s house, these works reveal the power of the landscape to transport the viewer to a time and place while inspiring a feeling that is at once personal and universal. This group exhibit will showcase paintings, drawings, collages and photography by 10 artists, opening October 19th – December 4th. A reception for the artists will be held Saturday, October 22nd from 5-7pm. Jane Bloodgood-Abrams, one of the area’s most celebrated landscape artists, graces us with breathtaking oil paintings inspired by the Hudson River School. Through views untouched by human intervention, Bloodgood seeks to explore a sacred realm within local settings. Also concerned with the natural world is Irish-born artist, Sue Bryan, who reflects on childhood memories with exquisitely detailed charcoal drawings of her homeland’s landscape. With a medium destined for gray scale, Bryan achieves a ranging palette of earth tones through the pristine execution of luminous light cast onto mingled tree branches, brooding clouds, and expansive meadows. Native San Franciscan, Judith Adrienne Miller, will exhibit mounted digital prints of iconic scenes that highlight the ‘City by the Bay’ while revealing man’s manipulation of it’s coastal landscape. Cable car lines in paved streets blanket the city’s rolling slopes, the Golden Gate Bridge dominates the rocky shoreline while the carved cliffs left bare by the ruins of the Sutro Baths demonstrate nature’s vulnerability. Frederic Church’s influence on realist painter, Bill Sullivan, is evident through the bold sense of color in his depictions of the Catskill Mountains complete with saturated sunsets and broad river views. In the work on exhibit, Sullivan introduces a human element, modernizing his subject matter by placing it against a dramatic urban skyline. Painters, Patty Neal and Robert Goldstrom, explore the relationship of nature and fluctuating light on dense city architecture. Neal plays with the concept of boundaries and the persistence of the natural world upon the unnatural. Invading vines and tree tops seep into the industrialized foreground, no matter how heavily paved or built upon. 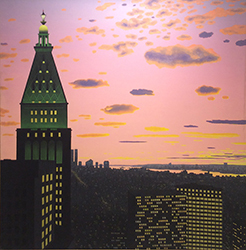 Goldstrom’s studies of New York City’s skyline are painted at various times of day, revealing shifts in color and perspective while the panoramic views show the meeting of skyscrapers and clouds. Trompe l’oeil master, Richard Brittell, also finds inspiration in city buildings, with a particular focus on Byzantine and Classical influence on modern architecture. Iconic marble columns executed in fine detail exhibit slight weather marks like badges for their ability to stand the test of time. Self-taught artist, Darshan Russell, paints in a naive style that is all her own. Using boldly hued paints right from the tube, Russell recreates charming scenes with thwarted perspectives you would think could only stem from her own experiences. Painted interiors of a staircase in a family room, or a bathroom clad with family photos are in fact based on other people’s family photos and newspaper clippings. Despite the details being so far removed from herself, Russell imparts a warm feeling of familiarity into every detail. David Austin’s figurative work captures life’s small moments, often with a dark or humorous twist. In his new series entitled, Wild Strawberries, Austin revisits memories with narratives that blend adulthood wisdom with childhood wonderment. Steven Poser’s series of abstracted flower vase studies attempt to unify surface pattern with spatial depth. These post-impressionist compositions incorporate a repeated still life with scraps of French wallpaper, juxtaposing intense color with increasingly abstract and geometric form. Each work is imbued with a vibrating energy, similar to that of a patchwork quilt, where the unique elements come together in harmonious rhythm.